Instead of raking the lawn after you mow, you can save yourself some time and effort while protecting the environment by leaving grass cuttings where they are. They’ll decompose quickly, providing the soil with vital nutrients such as nitrogen and phosphorous. This way you won’t need to use chemical fertilizers in your lawn, which are not always so environmentally friendly. While we’re on the subject of grass, make sure the grass species in your lawn is suitable for your climate to avoid wasting water. For example, Kentucky bluegrass needs extra water and extra care in dry, warm climates like California or Arizona. Do your research to determine what type of grass is best for your area. Avoid watering your lawn during the hottest part of the day (between noon and 5 p.m.) or in high winds to prevent excess evaporation. Also, try to water less frequently but more deeply. Water every three days instead of daily, and leave the sprinkler on for an extra 5–10 minutes each time you water. For bonus points, you can also use a rain barrel to capture rainwater for use in your lawn and garden. A gas-powered lawnmower can generate as many atmospheric pollutants as 11 automobiles, according to the Environmental Protection Agency. Riding lawnmowers, meanwhile, generate even more pollution. The good news is, electric lawnmower options have become far more capable and widely available in recent years. 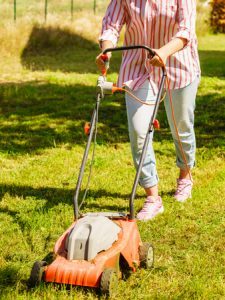 If your lawn is relatively small, you might even opt for a manual reel lawnmower. Looking for professional, friendly lawn care and tree services in the Fairfield County area? Contact Brother Tree & Lawn Service today at (203) 767-2915 to get started. "We often tell people of your good work and the good things you did for us at our home and for us at our children's home. You have a wonderful organization."